Whether you’re someone who wants to test their PC components because they suspect a possible fault, or have bought / built your own PC and want to make sure it runs stably and reliably at maximum load, you need a program to be able to put the system under the desired levels of stress for periods of time to monitor the situation. Here are 10 tools (9 of them free) to do just that and put your system under huge amounts of stress to check for faults or problems. HeavyLoad is a utility that aims to stress the main component areas of a PC, namely processor, memory, hard drive and graphics. It can also run these tests individually or altogether which is obviously the time maximum stress will be placed of the system hardware and also the power supply. The Disk space and Free memory tests are not really there to put undue stress on those components, but rather continually writes a large file to the drive and allocates / deallocates memory to the system simulating heavy load when all major components are utilized. 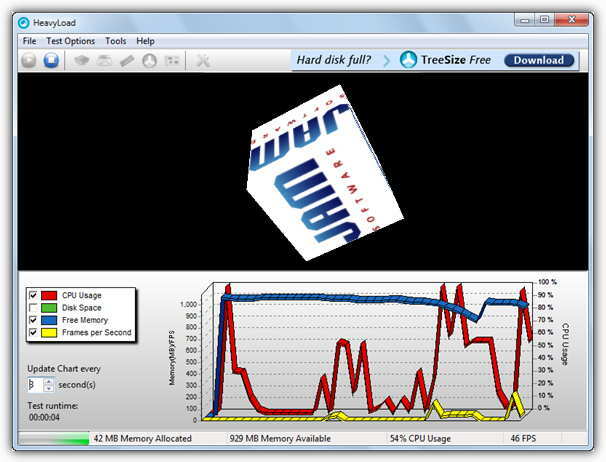 There is an option though to add more stress to the hard drive by using Jam software’s other popular included tool Treesize Free to simulate more heavy disc access. HeavyLoad is available as portable and installer versions and is a very useful overall system stability tester to keep in the USB toolkit. Works on Windows XP to Windows 8 32-bit and 64-bit. 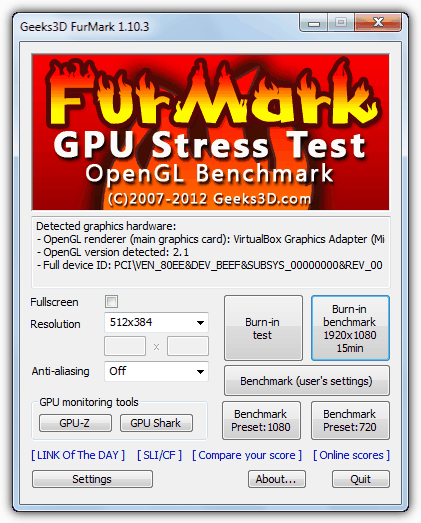 Furmark is a stability and stress testing tool designed especially for graphics cards and runs a very intensive “Fur” rendering algorithm which is very good at pushing the GPU to its absolute limits. There are a few settings that can be changed such as resolution, full screen mode and anti aliasing, and a few presets are available such as running in the HD resolutions of 720 / 1080, or running a burn-in test for 15 minutes. The benchmark’s default run time and an alarm for the maximum allowable temperature for the graphics card is found via the Settings window. Benchmark scores can be compared or viewed online. FurMark is compatible with Windows XP and above. This is a simple, tiny and portable utility of around 20KB that can run a stability test on your single, multi core or multi threaded processor. In addition it can also perform a couple of other tests such as a simple GPU graphics test and also one for the hard drive. The “Paint-Stress” GPU test is enabled by default and the “HD-test” and a more aggressive CPU test which will push your processor towards 100% (the standard test used about 60% of a dual core CPU during testing) can be enabled by the buttons at the top of the window. StressMyPC works on all versions of Windows 2000 and above, including 64-bit. 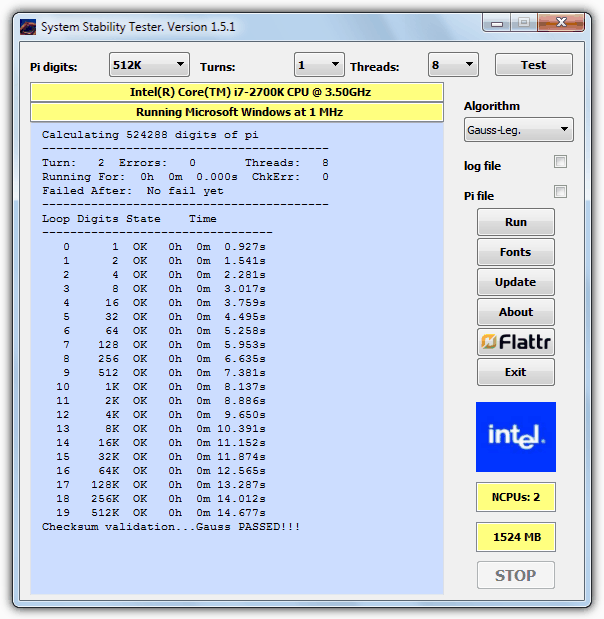 System Stability Tester works by simply using the well known and famous method of telling the computer to calculate the value of Pi up to 128 million digits. This will completely consume your processor for as long as the test runs and can also be used as a basic benchmarking tool to see how long it takes your CPU to calculate the specified number of digits. The range can be between 128 thousand up to 128 million and can be run continuously up to 50 times using up to 32 threads. There are 2 methods to choose from, Borwein and Gauss-Legendre which is also used by the classic SuperPi tool. Works on Windows XP and above, portable and installer versions are available. Despite the name, IntelBurnTest actually works fine for testing on AMD processors as well, and is called as such because it makes use of the Intel Linpack libraries which Intel themselves use to stress test CPU’s. Usage is easy and all you have to do is set the number of times to run the test, the number of threads to use and the test stress level. This can be Standard, High, Very High or Maximum and if your available RAM is less than what the test requires, choose Custom and set the amount of memory to use accordingly. The program is portable and runs on Windows XP and above. 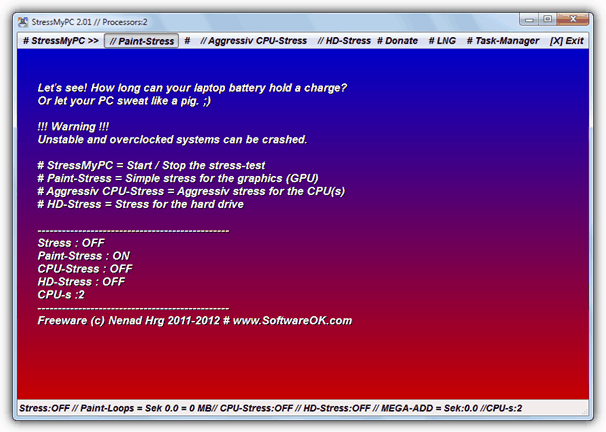 A nice collection of stress tests, but I am currently searching for DOS-based software. Will keep looking, but perhaps you could add something in this vein the next time you update the article? I generally run Orthos and MemTest. For the hard disk, when I get a new one, I copy tons of files big and small to it and then try using these files. Last drive showed problems immediately after this. I also always do a Nero Recode and x264 encodes since these are heavy CPU programs. Useful tool and have noted contributors very helpful warnings. Looks like a decent benchmarking software. Thanks Ray! Run it well BEFORE your warranty expires. Make sure you didn’t get a system with faulty components. Don’t experiment on an older system (with gigs of files & programs at risk). If something is “marginal”, these programs WILL find them – often destructively! 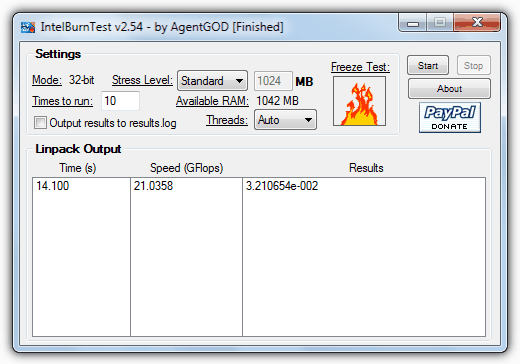 Second this – it is actually possible for stress testing software to fry your PC. E.g. normal use of a video card will not come close to the temperature and power consumption of running a 100% stress test like FurMark, and this could cause an otherwise working component to fail. It does mean the component is running out of spec, so it could even be recommended to run this just before your warranty expires, but not after.